This is single-user software intended to install on one single Windows computer. 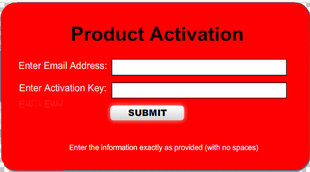 During purchase, we sent you an activation key code (i.e. : XXXXX-XXXXX-XXXXX-XXXXX ). Each key can only be used on one computer. The same key cannot exist on two computers. Therefore, before using it, be certain this is the computer you wish to run it on. Copy and paste your activation key into the software exactly as you received it (including dashes) If you see an error message about an incorrect key, it usually means you have typed it incorrectly. Try copy and paste.